French toast originated as a way to use up old bread by dipping it in a batter and frying it. But, French toast may not have originated in France. In the Apicius, a collection of Latin recipes from the 4th century, a recipe mentions soaking bread in milk and placing it into an oven to heat, but not to dry out. It is referred to it as alter dulcia, meaning "another sweet dish." (YES! My four years of Latin in high school not only helped with the SAT's and legal terms but now has also helped with cooking.) Marcus Gavius Apicius was a Roman gourmet and an ancient foodie who lived during the 1st century AD, and the Apicius is falsely attributed to him. But, it sounds way cooler that an ancient foodie has a collection of recipes, right? The Apicius recommends adding some honey on top of the toast for some added sweetness. 15th century recipes for pain perdu, French for "lost bread", describe a way to use bread which has gone stale. The bread is soaked in a mixture of eggs, milk, sugar, and some spices, and it is then fried. This is the French toast that most of us know today. 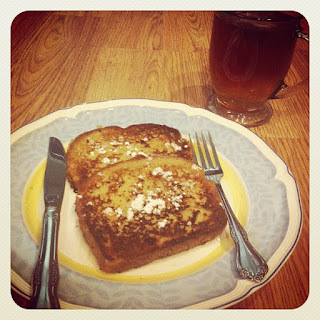 I had some dry, almost-crunchy leftover homemade white bread, so it was time to make French toast! A while back, an episode of America's Test Kitchen featured a French toast recipe, and they suggested drying the bread out in the oven. By drying out the bread in the oven, the French toast was crisp on the outside and deliciously velvet on the inside. The traditional egg-milk batter usually gives me soggy French toast. This time, I tried a new recipe from The Best New Recipe (also from the creators of America's Test Kitchen). This recipe used flour in the batter. The flour aided in the crisping and kept the bread from becoming greasy. The French toast was moist and custard-like. It's a winner! With the two simple changes of "drying out" the bread and adding of flour in the batter, this made for some simply sweet French toast! Adjust oven rack to middle position and preheat oven to 350ºF. Place bread on wire rack set in rimmed baking sheet. Bake bread until almost dry throughout (the center should remain mostly moist), about 15 minutes, flipping the bread halfway through cooking. Remove the bread from the rack and allow the slices to cool for about 5 minutes. After the bread has cooled, heat a 10- or 12-inch skillet over medium heat for 5 minutes. In a shallow pan or pie plate, beat the egg lightly. Whisk in the melted butter, then the milk and vanilla extract, and finally add the sugar, flour, nutmeg, cinnamon, and salt. Continue to whisk until smooth. Soak the bread without over saturating, about 30 seconds per side. Pick up the bread and allow the excess batter to drip off. Repeat with the remaining slices. Swirl 1 tbsp. butter (or coconut oil) in the hot skillet. Transfer the prepared bread to the skillet in a single layer, and cook until golden brown. Cook each side about 45 seconds on the first side and 1 minute on the second. After each batch is finished, add 1 tbsp. butter or coconut oil to the skillet for each new batch. Serve the French toast immediately with any desired toppings. I'm gleeful that you prioritize quality, like me--why, between the unbleached flour, quality bread, and coconut oil, this yummy is that much more yummier! Yay on the macarons! The texture will be effn brilliant tomorrow. You'll love me. I love French toast but I soak my bread in the custard until it's all gone, then fry in a little bit of oil until lightly golden brown and then bake until the custard is set. Can't beat good French Toast! Yum!